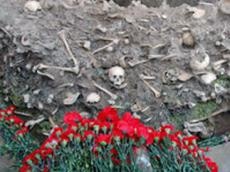 The embassy of Azerbaijan in Serbia has organized a commemorative event to mark March 31- Day of Genocide of Azerbaijanis. The event brought together officials of the embassy, representatives of Azerbaijani Culture Center, Serbia-Azerbaijan Trade and Economy Chamber, members of the Azerbaijani community and journalists. Addressing the event counselor of the embassy Gabil Kocharli briefed the participants on the history of the genocide committed by Armenians against Azerbaijani people. He said today Armenia continues to pursue the policy of ethnic cleansing and genocide against the Azerbaijani people. Speaking about Armenia`s aggressive policy against Azerbaijan Kocharli noted terrorism is part of the policy of this country. Other speakers at the event stressed the importance of the Decree “On the genocide of Azerbaijanis” signed by national leader Heydar Aliyev on March 26, 1998.